Tate Modern opened two major works in the Tanks today. Emeka Ogboh’s immersive, multichannel sound installation, The Way Earthly Things Are Going 2017, fills the subterranean East Tank in the Blavatnik Building. This installation is on display for the first time in the UK following its debut at documenta 14 in Athens. In the South Tank, The Lightning Testimonies2007, a powerful eight-channel, digital video installation by Indian artist Amar Kanwar is being exhibited. Both works will be on display until 4 February 2018. 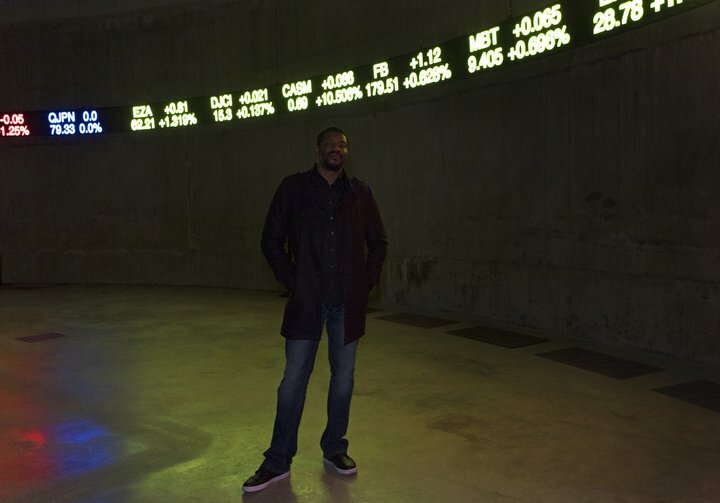 Ogboh’s The Way Earthly Things Are Going, whose title is taken from a lyric in Bob Marley’s So Much Trouble in the World, features live-streamed stock exchange data which scrolls along the circumference of the Tank in 25 metres of red, green and blue LED displays. In tandem, a spellbinding, ancient Greek lament, When I forget, I’m glad, recorded specifically for the piece,is played through twelve speakers creating a polyphonic audio installation. The song conveys tales of exile, forced migration, and the search for a better life. Nominally taking the Greek economic crisis as its subject, the work engages with issues such as migration and the international financial crisis. The Way Earthly Things Are Going is being presented to Tate by Modern Forms and will begin the artist’s representation in Tate’s collection. Kanwar’s The Lightning Testimonies 2007 confronts violence by questioning the use of sexual brutality in times of political conflict. As an artist and filmmaker, Kanwar tries to understand experiences of trauma and survival. Rather than representing people as victims, his work emphasises the possibility of resistance. The brutal split that created India and Pakistan in 1947 is the starting point for a layered exploration of women’s experiences in disputed terrains across South Asia. Going beyond documentary approaches, Kanwar’s reflective commentary examines the capacity for unspeakable horror alongside the resilience and dignity of those who suffer, and those who protest. The work is being purchased with funds provided by the South Asia Acquisitions Committee. We are thrilled to present these two outstanding installations at Tate Modern in the Tanks: Emeka Ogboh’s The Way Earthly Things Are Going 2017 and Amar Kanwar’s The Lightning Testimonies 2007. Both artists have attracted our attention for many years with their thought-provoking and ambitious practices. Ogboh’s piece was one of the most acclaimed works at documenta 14 and has particular poignancy, power and relevance in our times. We are delighted that Ogboh will now be represented in Tate’s collection thanks to the generous gift of this work from Modern Forms. Thanks to Tate’s South Asia Acquisitions Committee, Kanwar’s searing piece which was first shown to great critical acclaim in Documenta 12 in 2007, will begin the representation of this important artist’s works in the national collection.